I was excited to finally watch this film a few weeks ago [in 2013]. Having spent a lot of time studying Disney at various stages of my degree, the lack of racial diversity and positive representations of people of colour is one of many aspects of Disney ideology that seriously bothered me. I am ever increasingly aware of my excess in privilege. As a white, middle class Australian, I do not have a strong understanding of the experiences of minorities in America except what I see through media. I do not feel adequately equipped to discuss at length the representations of race in this film, but will attempt to outline some of my concerns. 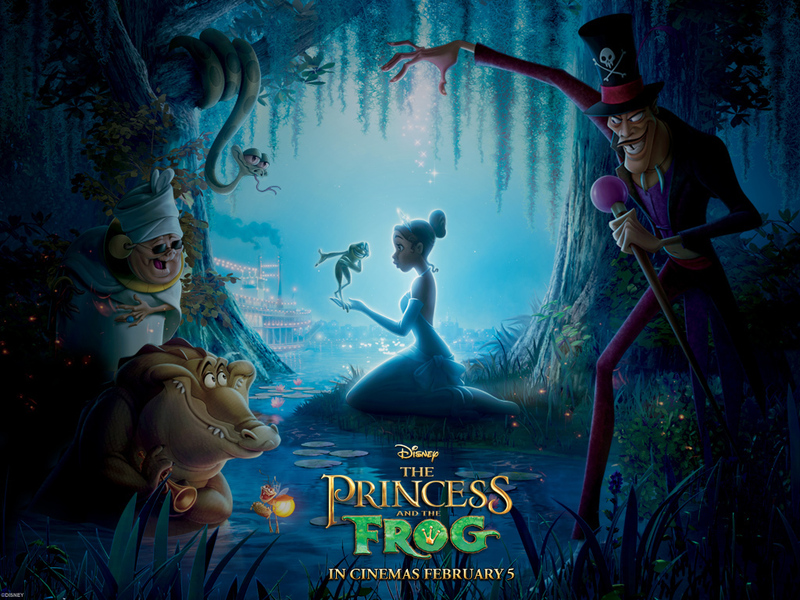 The final credits state the film was "inspired in part" by the novel by E. D Baker The Frog Princess. Pretty much the only thing taken from the novel is the idea of the girl become a frog instead of the frog returning to his Prince form when they kiss. The decision to have an African American princess is good. It is a good thing, but I do have some reservations about it (see Problems). Tiana is an interesting character, she has personality, aspirations not solely focused on marrying a Prince, and something she is passionate about. Tiana's future happiness is not entirely based on finding a husband. The relationship is not love at first sight, there is some kind of relationship development. The film shows that working hard for what you want is rewarding in and of itself. This is a pretty good post that shares many of my concerns about the film, but is also somewhat positive. For some time now Disney has been "diversifying" their Disney Princesses. I use inverted commas because I do not believe that this is much more than a token gesture by the corporation, and Tiana does not seem like an exception. The fact it took Disney until 2009 to create an African American princess is ridiculous. *Disney ideology is a pervasive and incredibly powerful cultural force and has been for some time. It has significantly contributed to racists discourses. The fact there was no attempt in this film to address any kind of discussion on the racist history of America (despite being set in the 20's) undermines the attempt to represent non-white experiences. A particularly good critical analysis of the way race is depicted in this film can be found here. The plot primarily revolves around Tiana and Prince Naveen's developing romance, and while it's not love at first sight it still happens pretty quickly, and despite Naveen's clearly depicted character flaws. It perpetuates the myth of "fixing" someone through a relationship, which is never healthy. While Tiana's character is much more rounded than some of the other Disney Princesses, the other female characters are pretty stereotypical and one dimensional. There were significantly more male characters than female. Ray's weird "relationship" with Evangeline, like a woman doesn't even need to be real for you to have a relationship, all you have to do is talk at her. (This is mostly an irritation in the context of broader cultural representations of women than the specifics of the film). One of the strongest aspects of Disney Ideology is the Americanism of hard work = success. Therefore is you are unsuccessful you didn't work hard enough, and it's your own fault. This movie fully embraces this ideology. Poverty is not that simple, the world is complex and it is set up to help certain kinds of privileged people succeed. The representations of the fireflies made me very uncomfortable. They were extreme and unkind stereotypes. While I can be very critical of Disney, and particularly their films, I do actually really enjoy most of their content (perhaps nostalgia has something to do with it). However, I did not enjoy most of this film. Through out the film I had a growing sense of unease, as it became clear the film lacked of any meaningful engagement with racial, gender or class issues. I didn't really connect with the story, in part this may be because of how much I liked E.D Baker's novel. The novel is a really great adaptation of the original fairy tale and her protagonist Emma is fabulous, flawed, strong, compassionate and relational. Most of what made the adaptation so great was lost in the film. I think what I disliked most, and why I wouldn't bother watching it again, is that there was a real opportunity for positive representations and it fails significantly to live up to the expectations I had.